Heated Cat Bed BUY Warming Cat Bed, Heated Dog Bed, Warm Cat Bed, Warm Dog Bed, Heated Pet Bed, 79345, Warming Dog Bed. 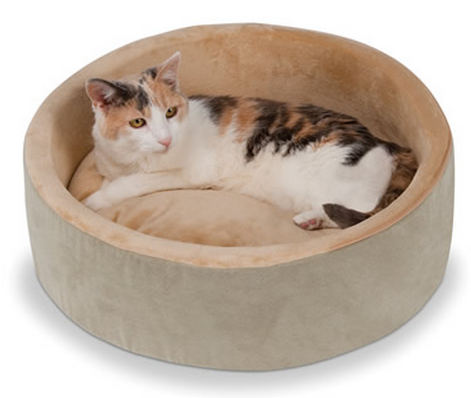 Heated Cat Beds offer gentle warmth to soothe older and arthritic pets. The Heated Cat Bed is equipped with a 4-watt heater that provides 102℉ radiant heat to keep this Pet Bed warm and cozy for your small pet. The Warming Cat Bed is warm to cats and small dogs, yet is not warm to the human touch. 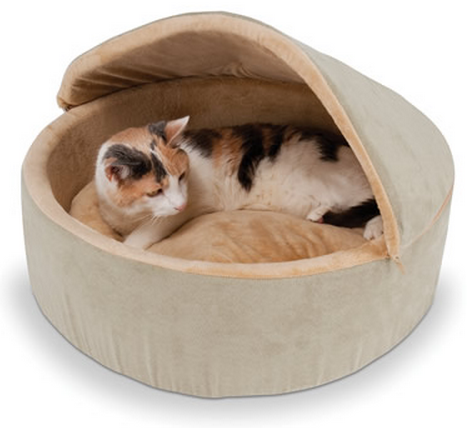 The interior of the Warm Cat Bed is lined with soft microfleece. A foam cushion on the bottom offers soft support. A removable roof provides partial shelter for your pet. The cover and cushion are also removable for machine washing. Powered by AC current, the Heated Cat Bed is suitable for use as a Heated Dog Bed. The Warming Cat Bed supports cats or dogs weighing up to 30 pounds. Integrated 4-watt heater provides radiant heat. Partial shelter provided by half-length roof. Non-slip surface on bottom for stability on hard floors. Cover and cushion are machine washable. Suitable as a Heated Dog Bed. Heated Cat Bed Product Number: 79345. Weight Capacity: Cats or Dogs up to 30 pounds. Universal design – fits on either foot. This heated bed for cats has a soft cover and cushion that my cat loves. Both the bed and the cover are machine washable.